Gov. Rick Perry position on "sanctuary cities" doesn't play well with Latino voters but his record of job creation and his business-friendly approach may cause some to look beyond that if he decides to seek the White House. It was an awkward moment for the swashbuckling, gun-toting governor of Texas. Fresh off the heels of several raucous welcomes before adoring groups of conservatives across the country, Gov. Rick Perry found himself staring into a crowd more intent on dessert than the speech he was delivering, and in his home state no less. There were conservatives in the audience at the National Association of Latino Elected and Appointed Officials in San Antonio last week, but they also appeared a bit stung by Perry’s recent promotion of tough anti-immigration laws, policy rhetoric many Latino political leaders say he must moderate if he hopes to court their community outside of Texas in any bid for the White House. The governor has not officially announced whether he will run for president, saying that he will decide soon. The same day Perry was sized up by more than 500 Latino officials from across the country, the group released updated statistics showing that the country has an estimated 12.2 million projected Latino voters, an increase of about 26 percent from 2008’s figures. Texas is home to about 2 million of them. Latino lawmakers in both red and blue states say Perry’s push to prevent so-called “sanctuary cities” in Texas — local governments that prohibit law enforcement from inquiring into the immigration status of persons arrested or detained — resembles measures proposed in several states that are modeled on Arizona’s anti-immigrant law that is now tangled in federal court. Perry’s rhetoric, some say, is a noticeable shift from his tone just four years ago. Perry doesn’t talk about a guest-worker program anymore. His push for “sanctuary cities” legislation was one of the rare defeats he sustained in the 82nd Texas Legislature, which completed its special session and adjourned on Wednesday. The measure failed to pass twice, once during the regular session and again during the special session. Even so, Perry’s unwavering support for such legislation could hurt him among Latino voters nationally, some national Latino leaders say. Some Texas lawmakers did champion a guest-worker program this session. It failed to win a vote in committee, however, and was not one of Perry’s priority items, despite being authored by a Republican. Asked why the governor’s philosophy has changed, Mark Miner, his spokesman, said the governor is a leader intent on letting the Legislature do its work. “The Legislature took the action they felt necessary. The governor does not micro manage every single bill that goes before the House and the Senate,” he said. Still, Latinos across the country warn against the assumption that their most important concerns revolve only around immigration. As with most voters, Latinos are also paying attention to what Perry has excelled at: job creation. 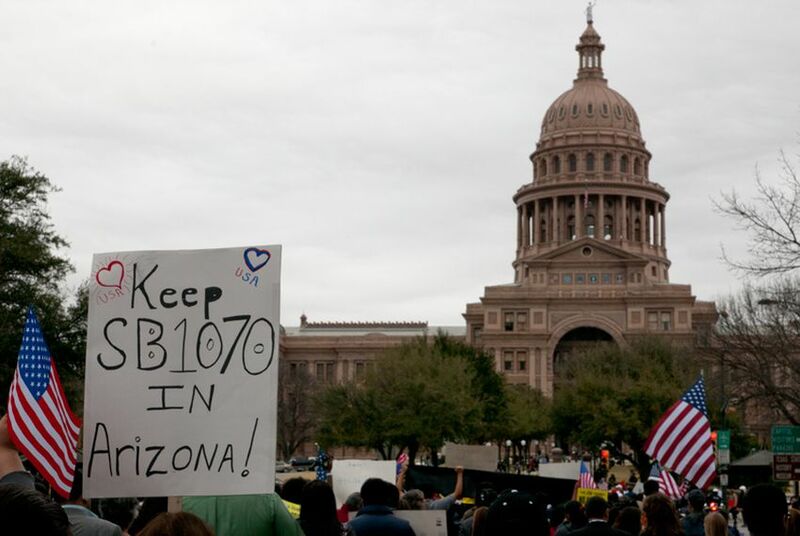 To some, that may be enough to look past or even forgive Perry’s anti-immigrant posturing. In his San Antonio speech, Perry did not talk, as he usually does, about border violence, illegal immigration or his disdain for President Barack Obama, a signal to some that he knew it would have resonated poorly. Martinez, a Republican, joins Perry in demanding more from Mr. Obama to ensure a secure the border. The two states border the Mexican state of Chihuahua, ground zero in Mexican President Felipe Calderon’s fight against a corrupt government and warring drug cartels. Miner said the governor’s failure to mention Obama’s name last week was not a mistake. The governor went to San Antonio, he said, to tout Texas’ leadership in job growth under his tenure, especially during a nationwide recession. “The governor talked about the same issues he talked about at the NALEO event that he does wherever he gives speeches and the primary focus of this administration has been on the economy and job creation,” Miner said. But the job creation claim deserves scrutiny, said NALEO President Sylvia Garcia. The numbers, 730,000 private-sector jobs in 10 years, according to the governor’s speech, have not necessarily favored Latinos. Under Perry’s leadership, Texas boasts a lower unemployment rate than the national average of about 8 percent. Latinos, however, have a higher unemployment percentage than the state’s average. According to the United States Department of Labor’s 2010 data for the civilian noninstitutional population, Latino unemplyment in Texas is at 9.4 percent, compared with 7.4 percent in the state’s non-Hispanic white population.